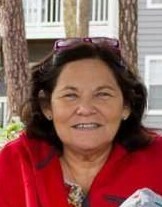 Connie Williams King, age 62, of Pearson, Georgia passed away on Monday February 11, 2019 at her residence. Mrs. King was born on September 12, 1956 in Douglas, Georgia the daughter of the late George Fussell Williams and Arlene Batten Williams. She was a retired teacher with the Coffee County School System after thirty years. Survivors include her husband, William A. King of Pearson, GA; two daughters, Kelli King of Pearson, GA and Victoria Ann Meador (Brett) of Athens, GA; son, William Oliver King (US Army) of Ft. Campbell. KY; two grandchildren, Garrett Isaac King and Silas Wendell Meador; two sisters, Nancy Harreth Futch of Pearson, GA and Lora Ann Pharis of Jasper, GA.
Memorial services will be held at 2:00pm Saturday February 16, 2019 at Sims Funeral Home Chapel with Rev. Billy Musgrove officiating. Sims Funeral Home, Douglas, Georgia in charge of arrangements.